For decades, the Colnago name has been synonymous with the ace of clubs. The original ace concept was thought of to commemorate Michele Dancelli having won the 1970 Milan-Sanremo on a Colnago. Because it was the first win of the Milan-San Remo by an Italian in quite a while, well-known Italian sports reporter Bruno Raschi came up with the idea that the ‘in fiore’ bike won the race. ‘In fiore’, which translates to mean ‘in bloom’, signified the start of a reawakening for Italian cycling. Since then, founder Ernesto Colnago decided every namesake bicycle, even this Colnago C64 Gold Private Collection road bike, had to carry the ace as a reminder of Colnago’s values, and a memory of the this momentous occasion. The C64 is special. While most brands build their carbon fiber bikes through a monocoque construction, the C64 sticks to it’s lugged carbon nearly all the way through. Among other things, this allows Colnago to offer a wide range of frame sizes and either a sloping or a horizontal top tube. And while lugged construction largely died in the 80’s alongside steel road bikes, there’s little to prevent the C64 from being one of the most-modern road bikes available today. But if the “all gold everything” conspicuousness doesn’t make it immediately obvious, this Colnago is one for the ages. 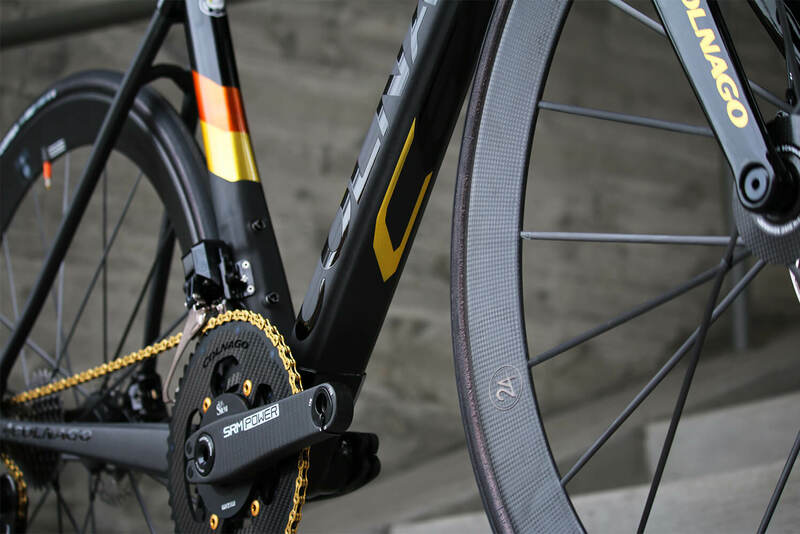 Limited to just sixty-four total bikes worldwide, the C64 Gold Private Edition builds on the Colnago’s revamped flagship road bike debuted mid 2018. It’s 24K gold leaf detailing on the frame, fork, seatpost, and saddle is complemented by a little number plate under the bottle cage to distinguish it from other C64 bikes. The standard C64 was already a special bike, this is just the gold flake icing on top. With a frame this snazzy, it only makes sense that rest of the bike rises to the occasion. A Shimano Dura-Ace R9170 groupset is standard fare, relatively speaking. But the Lightweight Meilenstein C 24D Schwarz Ed wheels, SRM Origin cranks with custom Carbon Ti chainrings, Berk Composites saddle, and gold CeramicSpeed pulley setup and bottom bracket really set the tone for what amounts to a ultra-lux ride. For the number-hungry among us, this comes in at 14.59 lbs without pedals. Sure, there are lighter bikes out there, but is there anything more ‘Colnago’ than this? To call this Colnago C64 Gold Private Collection road bike part of an awakening would be a lie. If anything, it sticks true to the formula set by the Colnago C40, the first carbon road bike to win the Paris-Roubaix: conservative in appearance, but extremely cohesive in design and application. Perhaps this Gold Private Edition channels the same spirit that created the ace of clubs identity in the first place. Nearly anything can be made into a occasion, from a Milan-San Remo win, to the 64th year of Colnago’s existence as a prestigious cycling manufacturer. But like that momentous win in 1970, the C64 Gold Private Collection is the brand once again finding itself at their absolute best. Have any questions about the Colnago C64 road bike? Send us an email any time to info@contenderbicycles.com, or give us a call during business hours.